On 21 February 2015, one JXX (not real name) claimed that he (and wife) purchased 15 million shares of VS Industry due to its fantastic latest quarterly performance (Table 1 below). 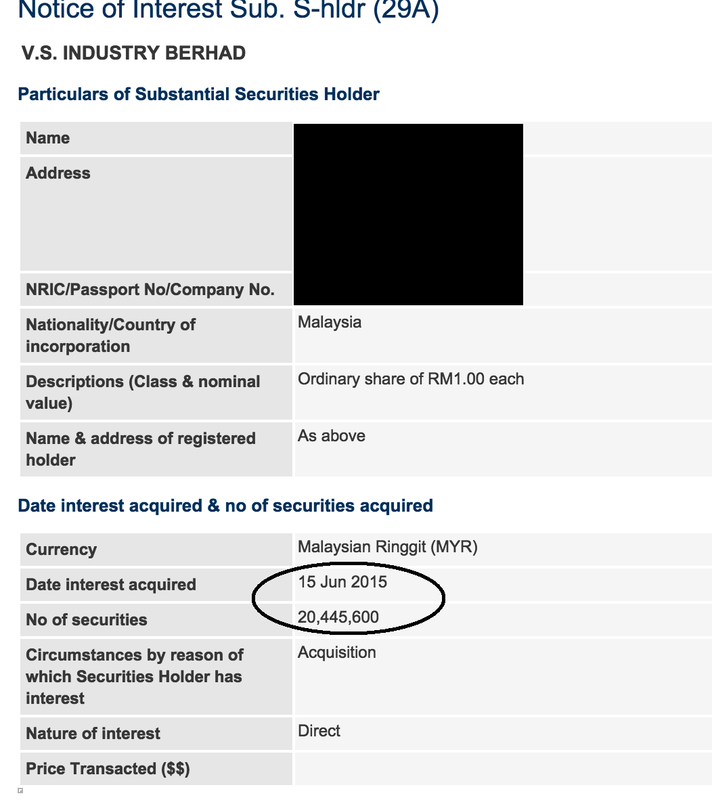 At that point of time if one was to have around 15 million shares, it would have triggered disclosure to Bursa as the number of shares would have exceeded the 5% threshold. 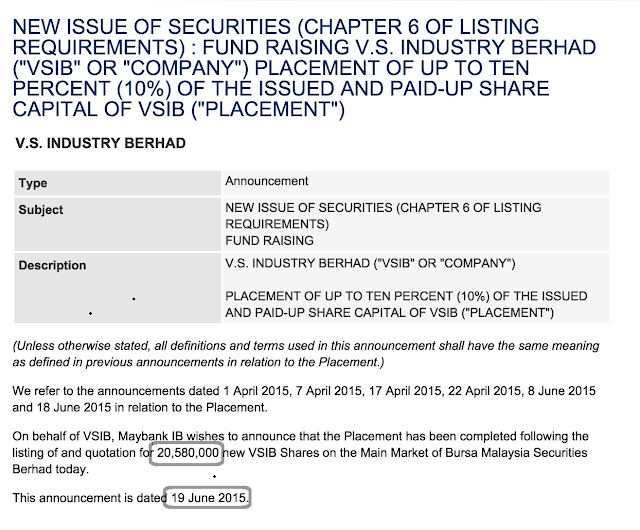 Total number of shares for VS Industry at that time was 205.3 million shares - 15 million / 205.3 million = 7.3%. 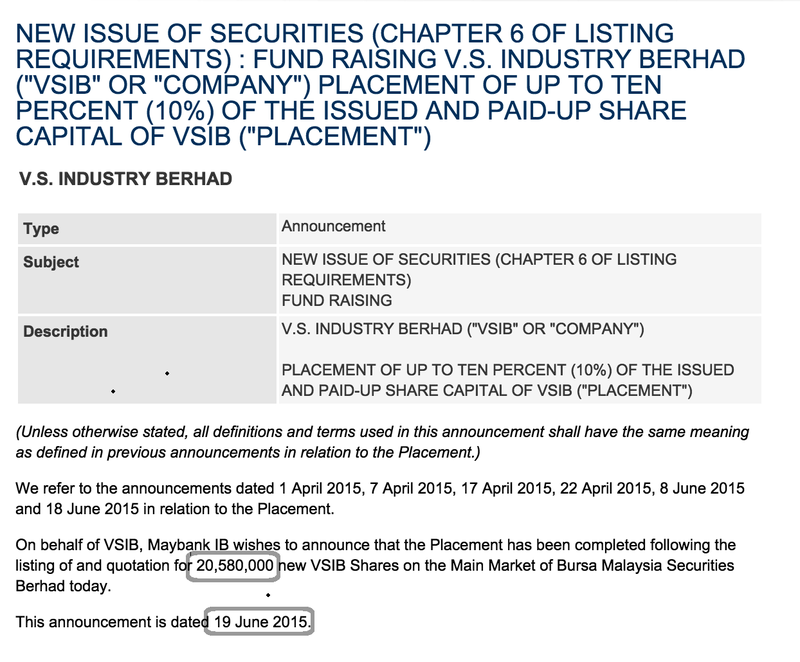 1 April 2015, VS Industry announced that it planned to issue around 10% shares via private placement. I would say this is a good move as if it raised them at a good (high) price, would be beneficial to the company. If however, it was issued at below what its value should be, then a bad move. 10% comes to about 20 million shares. Around the same time, JXX (again not the real name) announced that he bought 20.446 million shares (Table 3 below) through a single transaction (I think). Could this be purchased through the private placement? If yes, could he be purchasing almost all the shares offered through the placement? Now my confusion is, if the same person claimed that he and wife bought 15 million shares prior to 21 February 2015, then why the 29A submission tells otherwise? He should have declared prior. Were these bought through proxies? The same JXX also has been promoting the shares since February 2015 but did he owned any or could some of those shares be bought by the wife? Note that the claim of purchase was done in February 2015 while the private placement was done in June 2015. I refuse to think that something is not right here, but these are things that does not seem right. I stand to be corrected. If however the placement was made to JXX, then it is definitely not right or ethical. Very Very Very Good observation. very good observation and sharing.